The 2012 US presidential election will reach its quadrennial crescendo November 6, 2012, less than a year from now. Should a Republican nominee win the election, it is most probable that he will be either former House Speaker Newt Gingrich (shown here) or Mitt Romney. Is a vote for Mitt Romney or Newt Gingrich a vote for yet another unfunded war of choice, this time with a nation, Iran, three times as large and populous as Iraq? Mitt says that if elected he will move carriers into the Persian Gulf and “prepare for war.” Newt is even more hawkish. America should continue “taking out” Iran’s nuclear scientists — i.e., assassinating them — but military action will probably be needed. Sound idiotic? Of course it does, but war fever corrupts the rational mind. We should remember that many Democratic liberals joined the last neoconservative military crusade launched by George W. Bush’s 2003 invasion of Iraq. The drums of war have been pounding away against Iran since Barack Obama was elected president in 2008. The Military-Industrial complex wants war, or the next best thing, a constant threat of war. Why else would Barack Obama go against his human rights instincts and continue to feed the war-lovers with drone attacks that kill civilians and assassinate suspected enemies, at no risk to American personnel? The ultra-Zionist politicians in Tel Aviv and Washington are pushing for military action that will solidify Israel’s role as the Middle East regional boss. Obama’s most recent pandering “I love Israel” fund-raising speech was at the New York city home of businessman Jack Rosen, chairman of the American Council for World Jewry. This was one of many such events designed to hold on to pro-Israel funds and voters, a demeaning act, in light of Israel’s current Occupation actions, but an act he hopes his peace and justice supporters will understand as something he must do to land safely in neocon-free territory in 2013. Whether enough of his progressive, non-PEP supporters, are open to giving the President slack during the campaign will be a factor in the success of his ultimate victory or defeat. If Obama fails in his reelection effort, what could follow would not be a fictional horror story. It will be Iran: the Sequel, coming to a military recruitment office near you in January, 2013. The US Senate has already bought tickets for the sequel. In a unanimous vote this week, the Senate adopted a provision as an amendment to Congress’ annual defense policy bill which would force the President to impose sanctions on countries and companies that do business with Iran’s central bank or purchase Iranian oil. Israel has long had its front row seats for Iran: The Sequel. In fact, additional tickets are already being printed in Tel Aviv. Two recent cases in point, dual explosions at Iranian nuclear facilities. Were they accidents or attacks by Israel? An Iranian nuclear facility has been hit by a huge explosion, the second such blast in a month, prompting speculation that Tehran’s military and atomic sites are under attack. Satellite imagery seen by The Times confirmed that a blast that rocked the city of Isfahan on Monday struck the uranium enrichment facility there, despite denials by Tehran. The images clearly showed billowing smoke and destruction, negating Iranian claims yesterday that no such explosion had taken place. Israeli intelligence officials told The Times that there was “no doubt” that the blast struck the nuclear facilities at Isfahan and that it was “no accident”. The explosion at Iran’s third-largest city came as satellite images emerged of the damage caused by one at a military base outside Tehran two weeks ago that killed about 30 members of the Revolutionary Guard, including General Hassan Moghaddam, the head of the Iranian missile defence program. Tehran sought to downplay the attacks, perhaps to avoid appearing incapable of protecting its facilities. Assuming these explosions are not accidental, what nation might be behind them? How many nations in today’s world do you know whose citizens would refer, even obliquely, to their spy agency unironically as the hand of God? ‘The road to Middle East peace lies through Baghdad’ is a line that’s peddled by the Bush Administration and the Israeli lobby. It is just possible that some members of the Administration really believe that by destroying Israel’s most powerful remaining enemy they will gain such credit with Israelis and the Israeli lobby that they will be able to press compromises on Israel. In his October, 2002 LRB essay, Lieven linked the invasion of Iraq to the eagerness of the neoconservatives running the war policy to solidify Israel’s control over the Occupied Palestinian Territories. Most members of the Bush and Sharon Administrations hope that the crushing of Iraq will so demoralize the Palestinians, and so reduce wider Arab support for them, that it will be possible to force them to accept a Bantustan settlement bearing no resemblance to independent statehood and bringing with it no possibility of economic growth and prosperity. The shift in the rationale for war was kicked off this week when Danielle Pletka, head of the American Enterprise Institute’s foreign policy shop, and one of the most prominent neoconservatives in Washington explained what the current obsession with Iran’s nuclear program is all about. The biggest problem for the United States is not Iran getting a nuclear weapon and testing it, it’s Iran getting a nuclear weapon and not using it. That seemingly contradictory statement is explained by the AEI foreign policy chief (click for a short video) when she says that the problem with Iran having a nuclear capability is that it gives Iran a ticket to join the international team of nuclear powers. The real problem to Danielle Pletka is that the moment Iran has a nuclear bomb and doesn’t use it, the Iranians can no longer be dismissed as a second class nation, weak and cowering before its neighbors who possess nuclear military capability. Instead, Iran will be seen as a “respectable” nation which possesses a military weapon to use in negotiating with its neighbors. Horrors of horrors, according to this major neoconservative Washington leader, Iran would become just like the rest of us, a nation with nuclear weapons. Did anyone believe Iran wanted the ability to destroy Israel and set off World War III? No one of course, except the Zionist propagandists who have been peddling Iran as the next Nazi Germany and President Mahmoud Ahmadinejad, as the latest Hitler on the world scene. Who will control the Middle East, the indigenous populations, or the outside invaders? The neocon doctrine that took us into Iraq in 2003 is very clear: International power decisions must be made by the enlightened West. The danger of that doctrine returning to the White House in less than a year, is very real. It is also true that such danger can be held up into the light of truth from individuals like Palestinian poet Rafeel Ziadah, whose poem, Shades of Anger (below), captures the indomitable spirit of a woman and a people, who refuse to permit outsiders to control and steal their freedom. 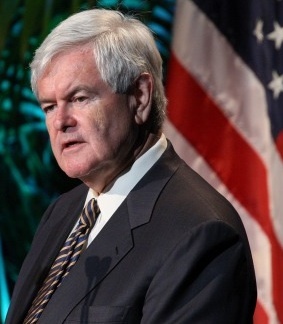 The picture of Newt Gingrich is from The Cable Blog on the Foreign Policy site. This entry was posted in Middle East Politics, Politics and Elections. Bookmark the permalink. If the U.S. wants regime change in Iran, then why is the Obama administration doing all it can to strengthen the regime there? It doesn’t make any sense – or is there no sense left in Washington? The more saber-rattling, the more Iran will circle the wagons, to say nothing of an actual attack, when all factions will set aside their differences and unite to save their country. That is the Persian way, and you would think Valerie Jarrett, who was born in Iran while her parents worked there, would know something about that and tell Obama? It is astounding to read AEI’s Pletka has spilled the beans that it’s not about whose got nukes, but whose got the power in the region that’s the issue. Oops, the truth leaked out! Remember folks, when it comes to mideast policy it’s all about Israel, and what it wants the US to do. Their neocon allies in this country push the Israeli agenda on Congress, where they have a stranglehold through the money AIPAC gives out to those who tow the line, and the money to fight those who don’t. Israel has been threatening Iran with war for years now, and it’s once again reaching a fever pitch. It’s allies in Congress and the media are quick to get in line. It happened with Iraq, and it’s happening again with Iran. The only way it will change is to fight AIPAC and their media allies tooth and nail, and copy their tactics. Do we have the courage and energy to do this? The last thing the US and the world need, is another war in the middle east, which, in effect, Israel has already started with its deadly sabotage in Iran, and bragging with great hubris about Mossad being the “hand of God”, when what they are doing is yet another abomination against their neighbors. It is painful to see our government behave as a tool of a foreign nation, but that’s exactly what it’s doing.